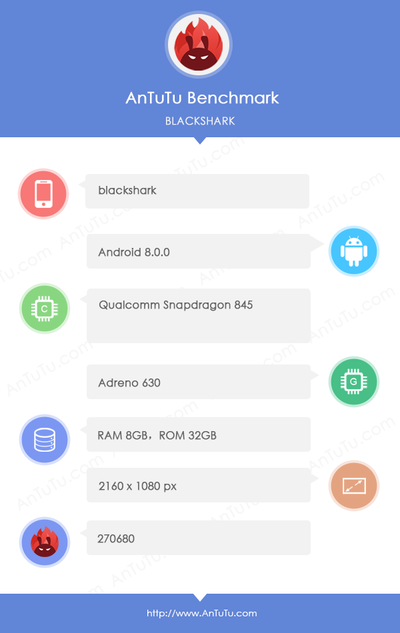 Developers of AnTuTu have published information about the characteristics of the smartphone BlackShark, tested in their benchmark. They themselves assume that this is the first-born of the sister company Xiaomi of the same name, the page of which recently appeared in the Weibo service. This company planned to focus on the release of powerful smartphones for mobile gamers. Judging by the data published by AnTuTu, BlackShark refers to such data. It is equipped with a display with a resolution of 2160 × 1080 pixels in an 18: 9 format with an unknown diagonal, a Qualcomm Snapdragon 845 processor with an Adreno 630 accelerator, 8 GB of RAM and for some reason a very modest 32 GB carrier. Most likely, it can be attributed to the fact that the testing was a prototype of BlackShark, by the way, received in AnTuTu 270 680 points. There is a smartphone running Android 8.0. Of course, it remains possible that the information on this device is an ordinary forgery. With the due desire and skill, anyone can create a virtual device based on the emulator, which will seem to AnTuTu a real smartphone. Qualcomm introduced the basic model of a full-featured helmet for augmented and virtual reality with Snapdragon 845 inside. The company believes that this platform will not only demonstrate the capabilities of the hardware platform, but will also become the basis for commercial devices from partners. In Qualcomm assure: announcements of such devices are coming soon. Earlier this year, several companies introduced helmets based on Snapdragon 835, including HTC and Lenovo. Devays received a generally positive feedback, but the new VR-headset will be even better. Snapdragon 845, which also includes an accelerator Adreno 630 and a coprocessor Hexagon 685, is 30% more efficient in graphics and at the same time consumes almost one third less energy. The latter is extremely important, because the helmets with this chip are autonomous, they do not connect to anything wires. 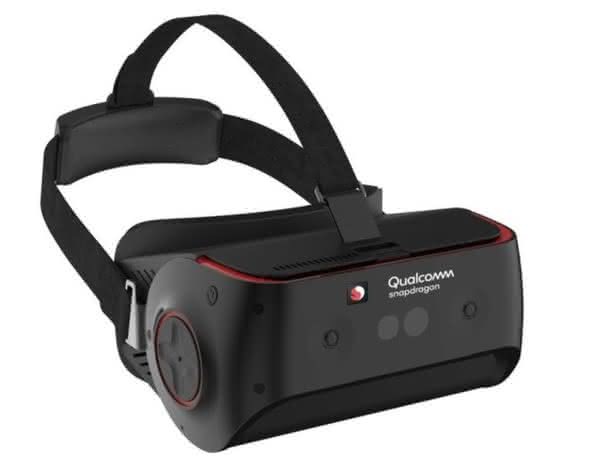 The Qualcomm reference headset with the built-in six-degree gyroscope, cameras and hardware environment re-creation system (SLAM) supports the technology Roomscale. It allows without installing additional modules around to determine the location of the owner and his movement around the room. An important innovation of the new VR platform based on Qualcomm Snapdragon 845 is Adreno Foveation technology. It thanks to the tracking of the view allows you to display the best quality image in the place where the user looks, redistributing the resources of the graphics accelerator. Qualcomm said that the new hardware reference platform has already been tested with Daydream. However, this does not mean its binding to Google, chipmaker is ready to help other partners who want to optimize their VR and AR-environment for a new chip. The Google Pay app has replaced the accustomed many Android Pay in the store. On the upcoming rebranding of the proprietary system of contactless payments, the search engine announced at the beginning of the year. Also part of the updated product will be the service Wallet, launched in 2011, but never received popularity. Reasons for rebranding are unknown, although evil tongues can be suspected by the search engine in the banal copying of Apple. After all, Google Pay is very similar to Apple Pay, and the logos of both systems contain icons directly associated with the names of companies. However, it is more likely that Google just wanted to unbind the payment service ideologically from one operating system. Perhaps the company will try to integrate it into the Chrome OS or even unannounced products. Despite the rebranding, the design of the application has remained the same. On the functionality in general, too, no change. Google Pay is a service that allows you to pay for purchases with a smartphone with an NFC module to a compatible terminal. In this case, not the data of a tied card, but a special code is transmitted to the terminal, which provides an additional security measure. Qualcomm introduced LTE-modem Snapdragon X24 with support for LTE Cat. 20, 5CA and MIMO 4 × 4. The main achievement of the novelty will be the maximum download speed of data, increased to 2 Gbps. This is a serious increase compared to the actual 1.2 Gbps that Snapdragon X20 can provide. This modem is integrated into the Qualcomm Snapdragon 845 processor, which will become the heart of many flagships in 2018. That is, we will see the X24 already in the top mobile GPU of 2019, the hypothetical Snapdragon 855. It can be announced this year, Qualcomm tries to hold such presentations earlier to provide an ideological advantage over possible competitors. The modem will be produced on a 7-nm process, most likely Snapdragon 855 too. Qualcomm already works on the 5G-modem, the first devices with which can be released already in 2019. It is unlikely that they will be massive, because operators must prepare and create networks of a new generation, close in scope with the current LTE-networks. So the release of Snapdragon X24 next year does not seem strange. MediaTek closed the line of flagship chipsets Helio X and focused on the development of Helio P, the top versions of which will outperform the performance of the Helio X30. According to Chinese sources, in the development of Taiwanese there is another promising project Helio P38, which will become an alternative to the mid-level chipset Snapdragon 632 (some sources claim that it will form the basis of Xiaomi Redmi Note 5, if it does exist). According to these data, the chip will receive four cores Cortex-A73 and four cores Cortex-A53 (peak frequency 1.8 GHz), which will be supported by graphics accelerator Mali-G72MP3 with a frequency of 650 MHz. A key argument in favor of the chip may be the price – Helio P38 supposedly appears in the devices of the price segment 800 yuan (7.1 thousand rubles). The timing of the announcement and availability is not yet announced, but it is rumored that Xiaomi and Meizu are interested in the chipset.